In this article, you will learn how to check your computer’s connection to the Internet through a ping test. The term ping refers to a computer network administration utility that is used to test connectivity of a specific host in the network with the use of Internet Protocol (IP). Click on the links below to know how to conduct a ping test according to the operating system that your computer is using. For Windows® 10 - Press the Windows key on your keyboard to access the Start screen. 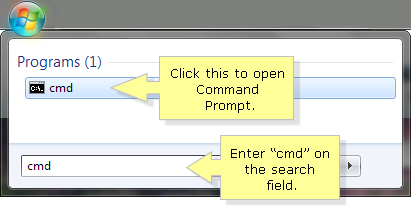 Type “cmd” or "Command Prompt" in the search field, and then select Command Prompt icon once the search result appears. For Windows® 8 / 8.1 - Press the Windows key on your keyboard to access the Start screen. 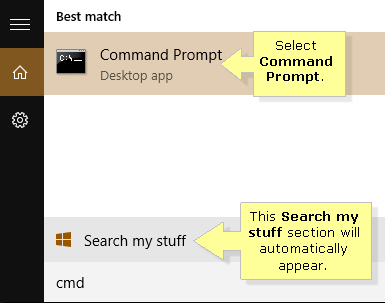 Type “cmd” or "Command Prompt" in the search field, and then select Command Prompt icon once the search result appears. QUICKTIP: You can right-click on the Start button and select Command Prompt. For touch-enabled computers, swipe from the right side of the screen to reveal the Charms bar with the system commands. NOTE: The Search section will automatically appear once you type in any character from your keyboard. For Windows® 7 / Vista® - Click the Pearl button and the enter “cmd” in the search field and then, click the Command Prompt icon once the search result appears. 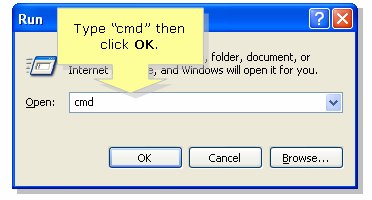 For Windows® XP - Click Start > Run >type "cmd" then click OK.
On the Command Prompt window, enter “ping yahoo.com” or any website of your choice then, press [Enter]. Check the Ping Statistics section. You should get several replies to confirm the computer's connection to the Internet. 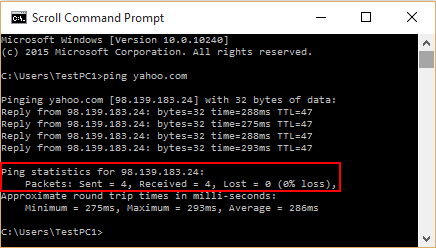 For example, the image below shows Sent = 4, Received = 4, Lost = 0 (0% loss), which means that you are connected to the Internet. 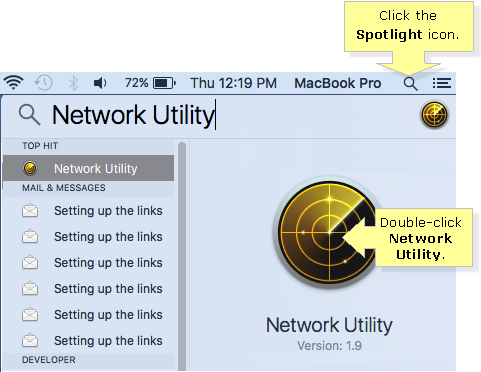 In the Menu bar, click the Spotlight icon and enter "Network Utilities" in the search field, then double-click the Network Utility icon from the search results. NOTE: For Snow Leopard, Lion, and Mountain Lion Mac OS, click on Finder > choose Go > select Utilities > Network Utilities. While in Mavericks, Yosemite and El Capitan OS X, click on Macintosh HD > System > Library > CoreServices > Applications > Network Utility. 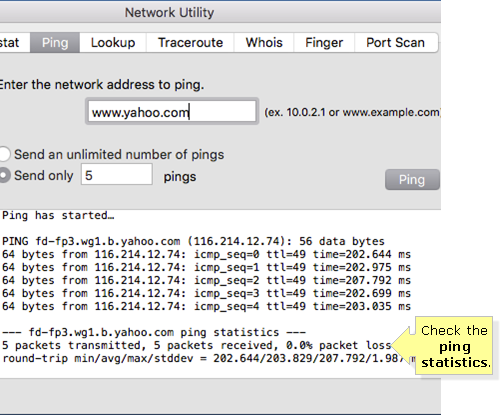 On the Network Utility window, select the Ping tab and enter “www.yahoo.com” or any website of your choice in the appropriate field, then click the Ping button. QUICK TIP: You may select Send unlimited numbers of pings to show multiple replies or Send only pings to choose how many replies you want to receive. In this example, we entered 5. Check the ping statistics. You should get several replies to confirm the computer's connection to the Internet. For example, the image below shows 5 packets transmitted, 5 packets received, 0% packet loss, which means that you are connected to the Internet. First, check your modem and router’s physical connection. If you have firewall or security software installed in your computer, you may need to reconfigure or lessen its security settings. Connect your computer directly to your modem and perform a ping test. If the test is successful using this setup, there could be a problem with your router or you may need to reconfigure some of the router’s settings. Power OFF and ON your modem for at least 10 seconds and try again. Contact your Internet Service Provider (ISP).